There are no excuses to base your supply and media strategy on assumptions about what works best. 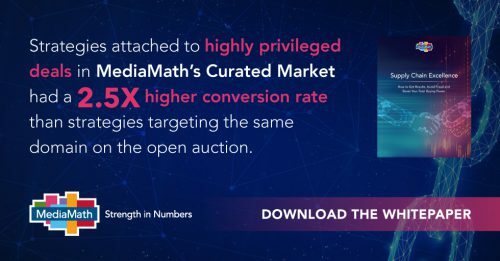 In the spirit of giving marketers and advertisers greater transparency into how the different modes of programmatic buying actually work, MediaMath has released a whitepaper based on research into our own data that sheds light on how PMPs and Open Auction actually perform according to some of the key metrics about which marketers care. We also approached some of our partners to help us confirm that what we were seeing is true across other aspects of the industry. It is our hope that marketers can use some of the insights that we’ve gleaned to build better data-driven strategies that will help them accomplish their marketing goals more effectively. Here are a few surprising findings from our research. 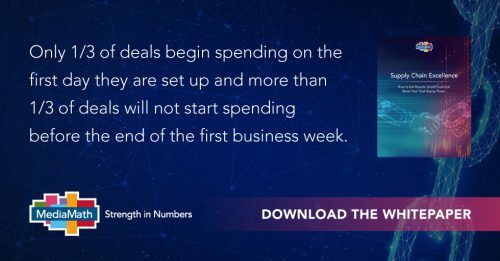 Only a third of deals begin spending on the first date they get set up—and more than a third of deals will not start spending before the end of the first business week. Each day spent troubleshooting PMP deals is a lost opportunity to spend their investment and see a return on advertising. For clients with a fixed period in which to run their campaign and who see a direct ROI from their digital spend, this delay translates to substantial missed revenue opportunities. 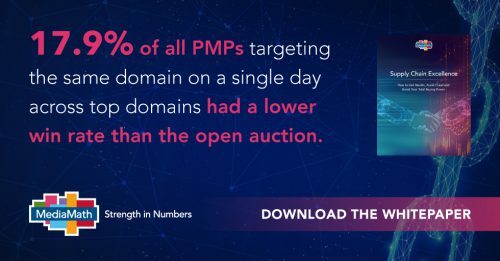 Fully 17.9% of all PMPs had a lower win rate than the open auction, meaning that advertisers are adding workflow difficulty, narrowing their optimization capabilities and taking on the sole accountability for supply chain cleanliness for no discernable benefit and a significant amount of the time. MediaMath consistently sees higher rates of sophisticated invalid traffic (SIVT)—instances of fraud, such as bots acting as legitimate users, that require advanced analytics, significant human intervention and other measures to detect and mitigate—on media purchased via PMPs than on our Curated Market offering, which carries a fraud-free guarantee that perpetuates through the supply chain and incentivizes the publisher to keep fraud low. The rates of fraud that we report across PMPs are consistent across the same PMPs on other DSPs. Download the full paper Supply Chain Excellence: How to Get Results, Avoid Fraud and Boost Your Total Buying to get a deeper dive into these trends and our guidance on how to use them to improve your data strategy. The interview originally appears on MarTechSeries. You can’t really prepare for disruption; you must learn to embrace and manage chaos. You have to be really agile in the way you operate and simply move forward, assembling every piece of the puzzle one by one — keeping in mind the big picture you have for driving the business forward. Right now, marketing isn’t working for a lot of people. It definitely is not working for marketers who, even now, more than two decades into digital and more than a decade into programmatic, are still left to wonder which half of their ads will work. Not publishers, who are getting squeezed from every direction. Not consumers, who recognize that they are the product. Legacy infrastructure and legacy processes are part of the problem—the Internet as constructed was never intended to sensibly connect the diverse and complex technologies brought to bear by the myriad, diverse constituents in our industry. Many of the longstanding problems we’ve confronted—fraud, lack of transparency—are a direct result. And consumers have gotten the worst end of the deal, with clunky, irrelevant experiences and mystery surrounding the use of their data. But there is a way forward that lets marketers maximize their investments without sacrifice and without compromising their values, lets publishers create the content that consumers want and the independent journalism that the world needs and lets consumers defend their right to a free and open Internet. It all starts with recognizing, understanding and respecting the consumer, and then reaching high-value audiences through access to high-quality supply. We’ve focused on the second part of the equation in our whitepaper, in which we share how marketers can make better decisions about their supply strategy, taking a holistic approach to get the outcomes they want and deserve. Our analysis is supported by research from our own demand-side platform. Today’s media buyers want—and deserve—results. They want promises, and they want to be recognized for their total buying power over time, not just the fleeting auction-of-the moment. We can work together to make that a reality. In September, we released Dream vs. Reality: The Real State of Consumer-First and Omnichannel Marketing, our research in partnership with Econsultancy that assessed the gap between marketers’ desire to deliver compelling, privacy-compliant experiences and what they’re actually doing in practice. Econsultancy surveyed more than 400 global marketers about everything from adtech and martech integration to AI and shared the results in a 36-page report. For anyone who hasn’t read the report or is short on time, we’ve distilled the main highlights into a one-page infographic we’ve released today. The global internet and the digital economy have created immense opportunity for advertisers and marketers to leverage economies of scale to help fund and fuel the development of digital services on the web and around the world. We marry buyers of ad space to sellers, with billions of dollars transacted in the process every day. But along with immense opportunity have come new threats. In the process of building a global platform for innovation and wealth creation, we have constructed an economic target for criminal enterprises to infiltrate, and they have taken advantage of it. This week, we saw American law enforcement, in cooperation with the private sector and law enforcement abroad, take the first significant step to signaling that the jig is up. After two years of investigation, the Department of Justice announced its first significant takedown of two global criminal ad fraud schemes. Those schemes used servers and malware to violate the security of millions of computers and trick advertisers into buying access to non-existent consumers on fake websites. In the process, they stole $36 million dollars from legitimate businesses. Multiple individuals were charged and taken into custody abroad. Domains and servers were seized. And those schemes have been shut down. This is more than good news. It signals the increased maturation of the global digital economy both as a tool for crime and as a focus for law enforcement in its efforts to deter abuse of access to a global, open internet. As societies and jurisdictions around the world grapple with a borderless internet, accessible to the law-abiding and criminal alike, there are important lessons to take away from this case. First, a communal interest in eliminating fraud allows for industry cooperation. MediaMath was just one of a group of about 30 advertising technology companies that worked with the DoJ to help them understand how the programmatic advertising system works and where and how to capture illegal activity. Ad fraud threatens advertiser trust in the digital economy, in programmatic advertising and in consumer faith in the legitimacy of the system as a whole. It is in all of our interests to cooperate to end it, because none of us alone can do it. And none of us want to be part of financing criminal enterprises. Second, we learned that law enforcement needs private-sector expertise and information to enforce the law. The expertise of the DoJ and the FBI’s cybersecurity teams is growing exponentially. But as the operators of the private networks and systems over which fraud is executed, the industry has insight and access to information that law enforcement does not. And third, we learned that law enforcement has to be able to cooperate across borders to stop crime on a borderless internet. The internet is global, and cooperation must be global to work. The list of cooperating law enforcement agencies and entities involved in this takedown ranged from Malaysia to the United Kingdom. We take the global internet for granted. We shouldn’t. The only way it will continue to grow and thrive is if we can all trust in its security and governance. Our industry can and should support funding the development of skills and capacity-building related to cyber security for law enforcement at home and abroad. We welcome continued cooperation with law enforcement at home and thank them for their service. How does a brand with a large focus on mobile marketing drive transparency and incrementality on what is normally a very fraud-prone channel? In general, Rosenblatt said the brand was often looking for help in navigating the digital media ecosystem. MediaMath helped fill that void. The brand migrated to a strategy of in-game ads aimed at low-frequency riders that are likely to get a response. One unit, for instance, is aimed at San Francisco Uber riders and is a lookbook for the top five restaurants for Uber riders in the city.